Families who refuse to participate in the program are reportedly labeled extremists. The agents live with their assigned families every two months — for five days at a time — and report on each family member’s ideological state, religious activity and social life. “The government is trying to destroy that last protected space in which Uighurs have been able to maintain their identity,” said Joanne Smith Finley, an ethnographer at England’s Newcastle University, according to The Associated Press. The “family member” spy program is the latest in a series of intrusive surveillance and security measures that Chinese President Xi Jinping has implemented in Uighur communities, including surveillance cameras equipped with facial recognition software on street corners and inside mosques, military police checkpoints, and internment camps for those suspected of extremism. With government spies inside their homes, Uighur families face greater risk of being reported for signs of extremism, which include having religious names, growing a beard, fasting, engaging in Islamic prayer or even abstaining from alcohol and tobacco. Uighurs living in exile in Turkey said their families in China felt oppressed by the government workers, also called cadres, assigned to them. They received pictures from their families with the cadres posing alongside them as family members — a site that nauseated Uighurs like Halmurat Idris. The Xinjiang United Front Work Department, a Communist Party agency, said in February that cadres were to live with their assigned families every two months for visits of at least five days. The cadres are to attend important family events like the naming of babies, weddings, funerals and circumcisions. They even sometimes share beds with members of their host families, reported the AP. Families who refuse to participate in the program are labeled extremists and run the risk of being sent to internment camps where inhumane conditions, death, torture and forced medication are rampant, former inmates said. Some families are assigned up to three cadres, all of whom are to report on each family members’ religious activities, ideological state, income, social activities, difficulties and other intimate details. “The vast majority of party cadres are not only living inside villagers’ homes, but also living inside the hearts of the masses,” read a message on the Chinese Communist Party’s official news site, according to the AP. Uighur families with cadres report, however, the cadre visits last longer than five days and that the very presence of these spies oppresses them. 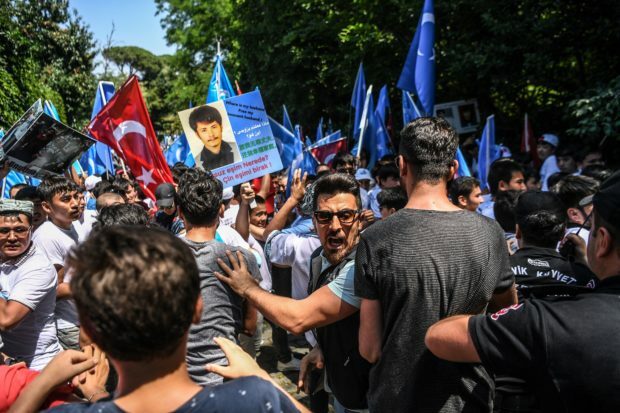 Uighurs exiled in Turkey also report that while cadres helped their families financially and have educated them concerning hygiene and culinary practices, they have also driven them to cut off ties with their relatives.